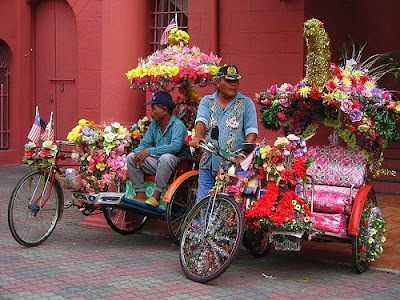 Beca is the Malay word for rickshaw or trishaw here becasue of the commonly found three wheel variety. Trishaw was a common form of transportation right up to the late 80s and some still preferring them in the 90s. While it is a relic of the past, the trishaw is making back these days as a tourist attraction and it is good for a slow pace tour. The common trishaw here is basically a bicycle with passenger cart attached. In Malacca and Kelantan, the cart is attached at the side, while in Penang it is in front, giving passenger better view in front. The trishaw has a convertible cover and it is really fun to ride into. I still remember while I was a kid, we normally go around Georgetown with trishaw. Always look forward to it.